Next novel I plan on reading is Rebecca Goldstein's latest. 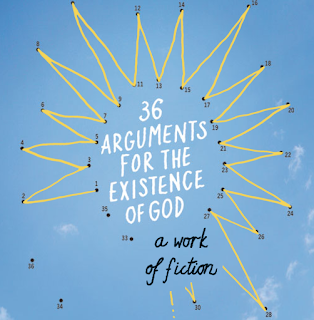 Yes, it's a novel, with 36 arguments for the existence of god somehow playing a role in the plot. I just came across the website that goes with the book. Philosophy never looked like so much fun. I just got my copy Goldstein's new novel the other day. Do you plan to do the kind of book discussions you sometimes do here? If so, let me know when you start reading. Have you read Frank Schaeffer's book *Patience With God*? I think you should have a look at it if you aren't familiar with it. I suspect you'd appreciate some of what he has to say. There are a few chapters on the New Atheists that seem right on to me; he also doesn't have any patience with Christian fundies (even though he once was one). Tom, Yes, I'll probably discuss the book here (I love the appendix of "proofs") so I'll let you know when I start. I haven't seen "Patience." OK, I'll have a look...and an old friend just sent me a paper critical of the new atheists, so this seems to be "down with new atheism" day. she was not very brilliant I think, but I haven't read the book yet. The appendix of proofs is fun. Still, I'm not sure I like how she frames the rebuttals. Frequently they are a bit overreaching (inevitable perhaps in a quick and dirty assebley of proofs that one is confidently rebutting). Proof 5. The Argument from the Fine-Tuning of Physical Constants. Flaw one consists in the fact that "The first premise may be false." While Flaw 2. notes that it may be the case that we are "living in a multiverse." Now I accept that if there are good reasons to think that a given premise in an argument can be challenged it is disqualified as a proof, but if your rebuttals consist in "premise x and y may be false, then all you have done is make the argument inconclusive. This of course is quite sufficient if your goal is to invalidate the "proof" status of an argument, but it does so only to the degree that it suggests there are other equally unproven possiblities in the neighborhood. So it becomes a war between two unproven sets of contentions (one set being much more plausible to a naturalist mindset). For my own part I am always amazed by how causally multiverse theory is thrown around. I find it to be quite marvelous, but also utterly incredible to contemplate. For all practical purposes, the human imagination might as well assign a numerical value of infinity to numbers thrown around in conjunction with multiverse theory. I'm not happy with her refutation of the cosmological argument. Or at least her first one. She asks simply, what caused God? The buck must stop somewhere, why not the universe? First its not quite clear that the buck has to stop.... And secondly, more importantly, what caused God is irrelevant to the understanding that God exists (from the argument anyways). E.g. I know that my computer was built in a factory somewhere.. What caused the factory's existence? I don't know. Does that put into doubt the computer's existence? (Say its a computer that we're debating the existence of). The cause of the cause is really irrelevant, if I've already shown the necessary conditions for one event must be met for the existence of some event that we do experience. I haven't gone through the rest of them. But I might use her list of 36 arguments in my class. It looks to me like she's just giving the reader a road map to the arguments and objections, not offering any argument OR objection as the final word on the matter. A fair and balanced report?